The annual Easter backpacking trip planning is finally underway. 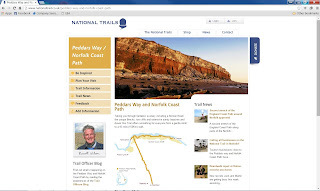 The National Trails website is my first place to go, followed by picking up a guidebook and a Harvey’s strip map. I then spend time reading up on the route and scanning the map for potential camping sites. Although unfortunately Harvey’s don’t do a strip map of this trail. The decision to take OS maps or rely on the guidebook alone for navigation isn’t an easy one to make. It’s a National Trail so the way marking should be decent enough, the Peddars Way is relatively straight as it follows the course of a Roman Road, and when it hits the coast… Well, how hard is it to get lost when I’ve got the sea on my left hand side? Then I have my gram weenie head saying that the OS maps will probably weigh less than the guidebook but I’m resisting the urge to whip out the scales and put them on trial. The start of the way is in a bit of an out of the way location, and I know that others who’ve done the trail caught a cab out from Thetford and split the fare. This is a solo venture at the moment but I have since discovered that there is a bookable bus that runs to the start and costs a miserly £2.20. A no-brainer then. As it’s Easter I’ve also emailed a couple of campsites along the trail to make sure that they were open and had space. What surprised me was the responses from two of the sites; one from a pub that had camping wanted to charge me £15.00, and made no concessions for someone in a tiny tent and who was on foot. The other from a national organisation that had a backpacker concession for non-members at £6.55 per night. Another no-brainer. Kit list compiling is the usual straightforward deal, with the usual musings over what cook system to take based on what food I fancy, so no change there. I’m debating whether to pack all the food I need or not. I’ll have a meal out but due to my dietary restrictions I can’t rely on finding stuff on route. At least on the coast there may be options but I could find myself subsiding on chips night after night. This might not be all hardship as I’ve discovered a fish and chip shop in Hunstanton that does gluten free battered fish so one less meal to pack. With four weeks left to go I’m also getting in some training miles when the weather allows but my right knee is beginning to complain which I’m putting down to the cold damp weather but have it strapped to be on the safe side. Have a great time Sir. It's a cracking little walk, with a surprising 'away from it all' feel. The pubs are splendid too. Hope you have a fab trip Baz. I am biased yes, but Norfolk is superb. Book that bookable bus as soon as you can! My friend and I did the walk last May and took said bus, which is great but very popular. We managed to get a slot, but not at the time we wanted. I think you can book from around a week beforehand, but best to check. As Alan said, splendid pubs en route, quite a lot of them of the posh gourmet variety and you'd be best to book if wanting a meal. Really hard to get lost of PW as you basically just keep going in a straight line! Don't miss Castle Acre priory, which is superb. And enjoy the wide open views and the birdlife, especially if you're doing the coast path as well - we were lucky enough to see a spoonbill.